Do you or someone you know need a daily dog walker while you work long hours? We can come once a day to give your dog a nice long walk and some play time. 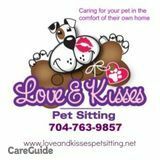 Call Love and Kisses Pet sitting for all your pet sitting a Dog Walking needs. Cat sitting also. Why put your pet in a kennel when you can have professional pet sitters come to you. You no longer have to rush home to let the dog out because when you have us as your dog walker, we are always here for you. We use state of the art on-line booking that you will have at your finger tips. Give us a call to discuss you and your pet's needs. We also offer cat sitting so you do not have to put your cat or dog in a boarding kennel.